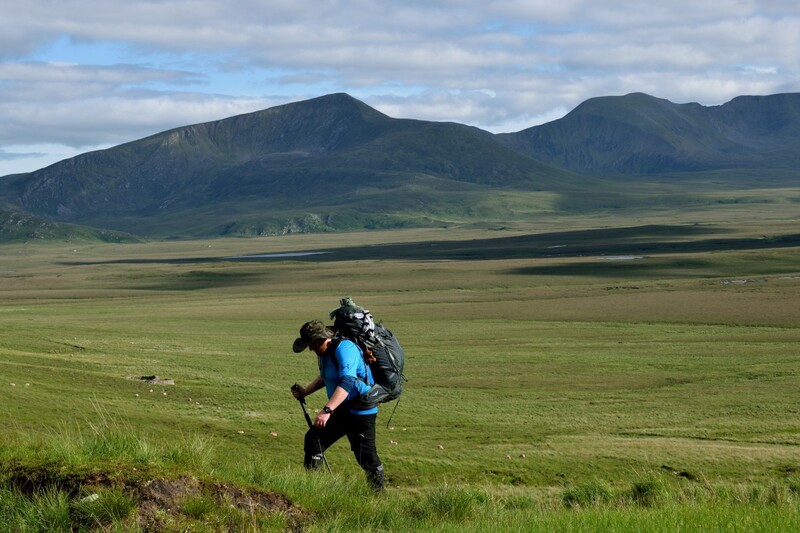 I stopped to draw my breath, my legs feeling heavier than they should have from the relatively minor incline, the weight of a full pack and soaking wet boots not aiding my cause. Whilst I gulped in a few lungfuls of fresh air, my eyes scanned my surroundings, the wonderful views providing the oxygen for my soul, and even the most weary of travellers would struggle not to be lifted by that view. On the horizon, the huge dark shark fin of the mountains on Achill island loomed large, as they pierced the blue-grey of The Atlantic. It was hot, a faint warm breeze offered scant respite, and sweat mixed with sun cream and midge repellent stung my eyes. The only sounds audible were the twittering of small birds, and off in the distance, the mournful throaty bleating of a lonely mountain sheep, calling to companions who didn’t answer. 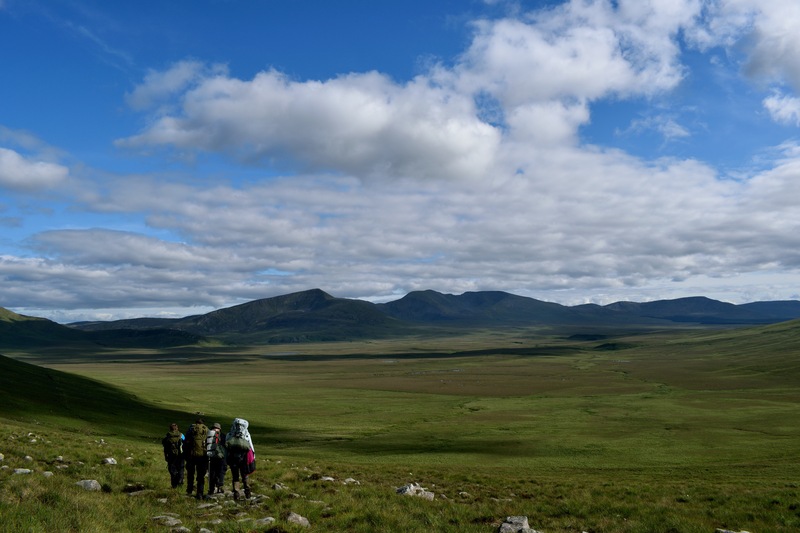 As I panned around, taking in the huge swathes of bog and tundra encircled by the Nephin Beg mountains, I could see a portion of our group had stopped up ahead and were also taking a break to enjoy the view/catch their breath. Looking back down the route from where we’d come, I could see the remainder of my companions approaching. The strains of Stealers Wheel’s song ‘stuck in the middle with you’ came into my head, this tickled me, and I smiled and hummed the melody, before tightening the straps of my pack, and squelching onwards up The Bangor Trail. 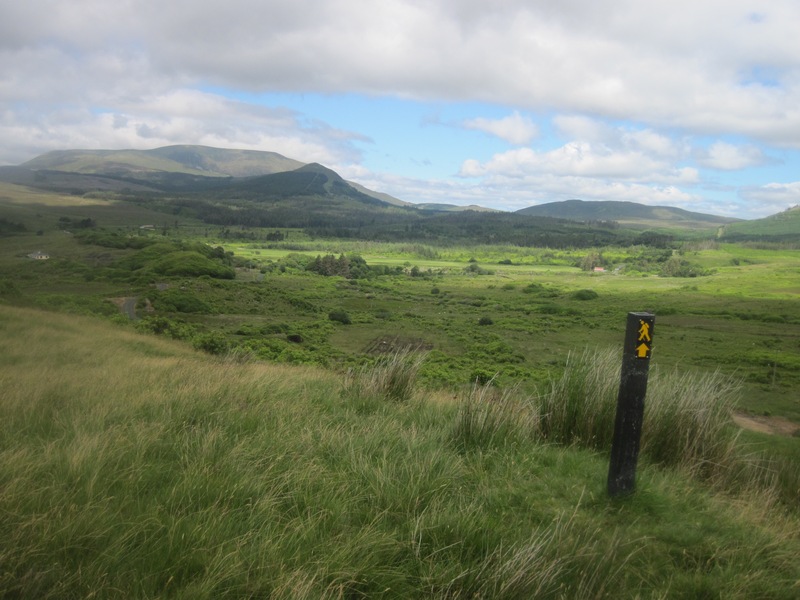 The Bangor Trail, situated in North Mayo, is an ancient, remote trail which winds its way from Bangor Erris to Newport through the Nephin Beg mountain range. Historians believe it may date back as far as the Iron Age, and it was used in more recent years by farmers driving their livestock to the market in Newport. 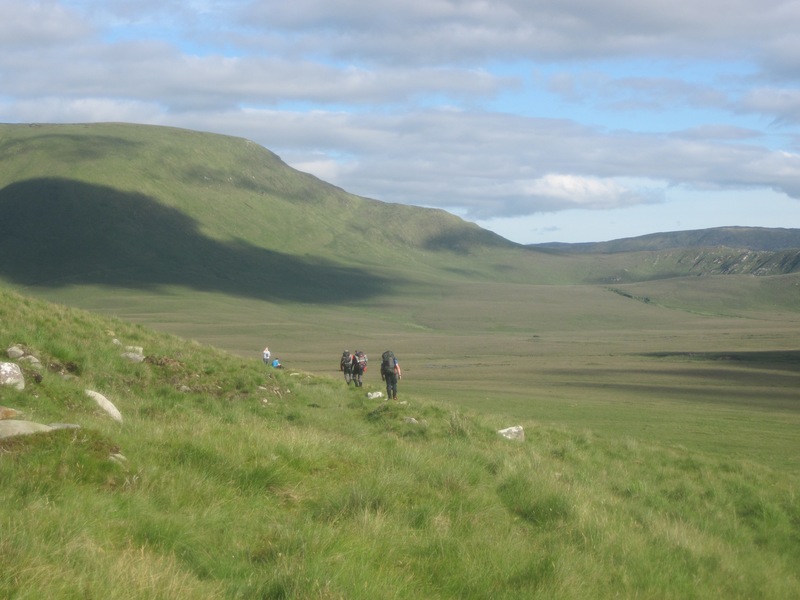 I’d come across articles about it while researching walks in the Mayo area, and it seemed to be the ideal spot for a Hikers Blog outing. Months of planning and group chats about the route, gear, food and travel all came to fruition when, joined by a few friends of the blog, we made our way down to the west of Ireland. There were nine of us in total, which was the largest group we’ve had on one of our adventures. 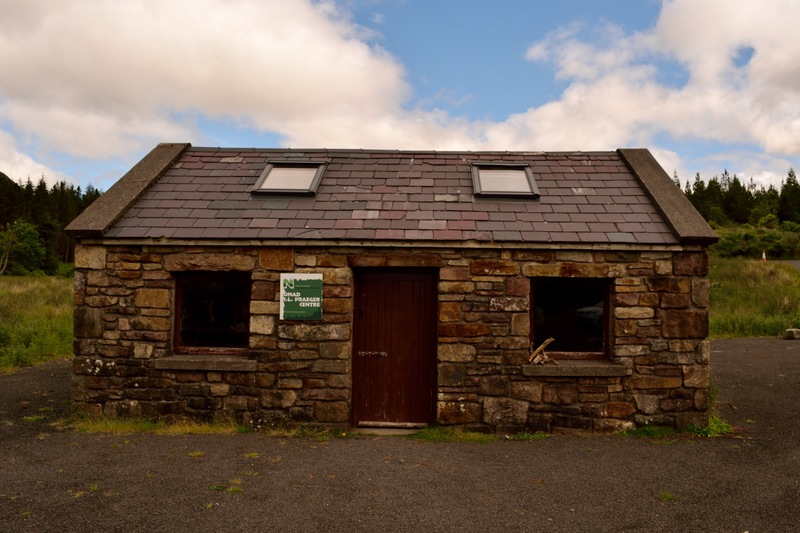 We had agreed to rendezvous at The Robert Praeger Bothy, a beautiful little one room stone cottage, which is open and free for anyone to stay in. 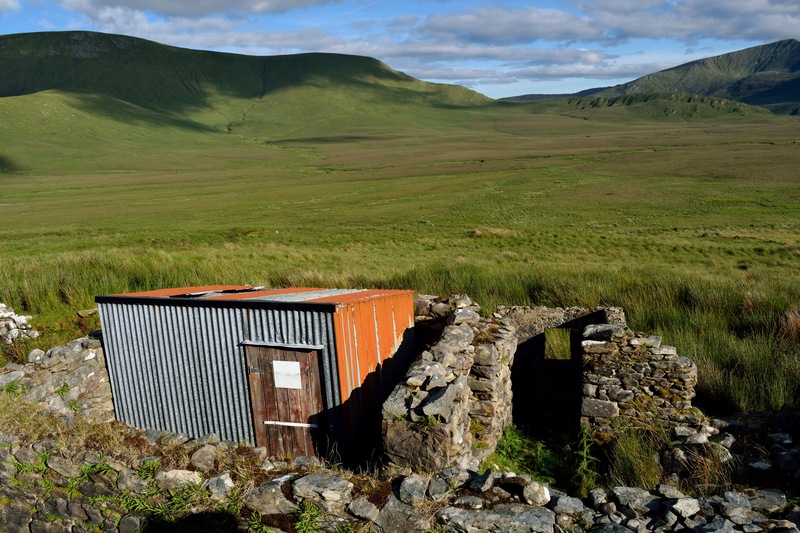 It’s named after the Irish naturalist who deemed this place ‘The very loneliest place in the country’. And staying there, it’s easy to see why. He made his comments in his book ‘The way that I went’ which was first published in 1937, but even in these days of mass transport and worldwide connectivity, this place has remained virtually unchanged, and as long dusk turned to night in Letterkeen, the silence was almost palpable. The group had all made the trip down safely, and when we arrived, low cloud and mizzly rain greeted us. A few of the guys had tents up, but the majority of us decided to bed down on the floor of the bothy. The weather dried up as true darkness fell, but there was no breeze to speak of, and the infamous Mayo midges appeared in their droves to feast on these new visitors to their territory. In the Bothy with the door closed we found respite from them, and a great few hours craic was had, before reluctantly calling it a night to prepare for our trek the following day. Everyone rose early the next morning, and after some faffing about with cars etc, we all found ourselves in Bangor village, ready to get going. Everyone had availed of the hot food and drinks at the local shop as ‘second breakfasts’ as we watched Salmon anglers collecting their permits from the pub across the road to head off and fish the local river. It was a damp and dreary morning, mist and cloud hanging around, with full blown rain at one stage. The weather started to pick up as we made the short walk out of the village, and then we were onto the Bangor Trail proper. A weather beaten sign at the start of the trail warned that the bridge across the Tarsaghaunmore River was out, and that we’d have to cross the river, warning that it might be dangerous in bad weather. The group had a quick confab about what to do, the sign said that the bridge was due to be replaced by 2016, and here we were in summer 2017. Surely it’d have been fixed by now? We all agreed that even if it wasn’t, we’d just have to cross the river, and we’d plan what to do when we got there. So off we went winging it, up the reasonable trail out of Bangor, boggy in places but easily negotiated. We contoured round Knocklettercuss and up, gaining height pretty easily, soon leaving the village behind, the breathtaking views laid out in front of us were truly a delight, and everything was progressing nicely. After a decent walk, which got progressively more boggy in places as we went (although thankfully some the worst areas of quagmire had handy board walkways skimming over them) we crested a small hill and began to descend. There in front of us was laid out the glittering, serpentine form of The Tarsaghaunmore River, looping and winding it’s way down from the bog to empty into Blacksod Bay. It was a wonderful view, apart from one thing. There was no bridge! The weather had got progressively warmer as the day had gone on, and at times when the wind dropped, it was stifling. When we reached the river, it was confirmed that if we wanted to continue on the trail, then we were going to have to wade across. The pillars of what used to be a bridge in years gone by rose out of the water where the path met the river, as if the landscape was sticking two fingers up at us, telling us we were going to get wet! Around and between these remnants of a once safe crossing, the dark peaty waters raced and cascaded on their way to The Atlantic, as the tumbledown remains of an old cottage sat silently watching. Everyone negotiated their way across without major incident, although me being me, took a stumble and ended up soaked to the crotch! Even though the water was relatively low, you could feel it tugging strongly at your legs as you crossed. I can imagine it’d be best avoided after a couple of days heavy rain. 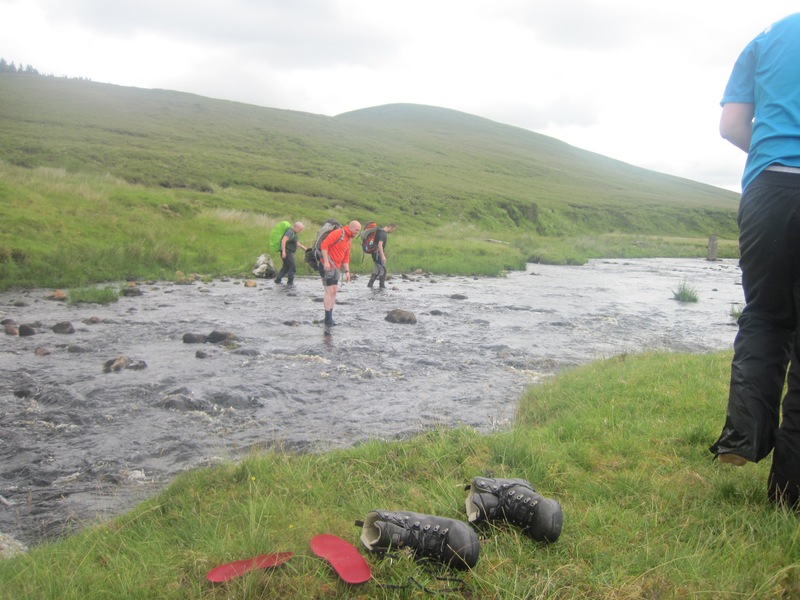 After we all crossed, we took a break for a spot of lunch, dried ourselves off as best we could, and set off again. The path took us upwards from the river on a steady enough ascent, with the odd steeper section thrown in to test legs heavy from the trek through the bog. The track itself was easily navigated in the bright, clear conditions, but the conditions underfoot at times were anything but easy. 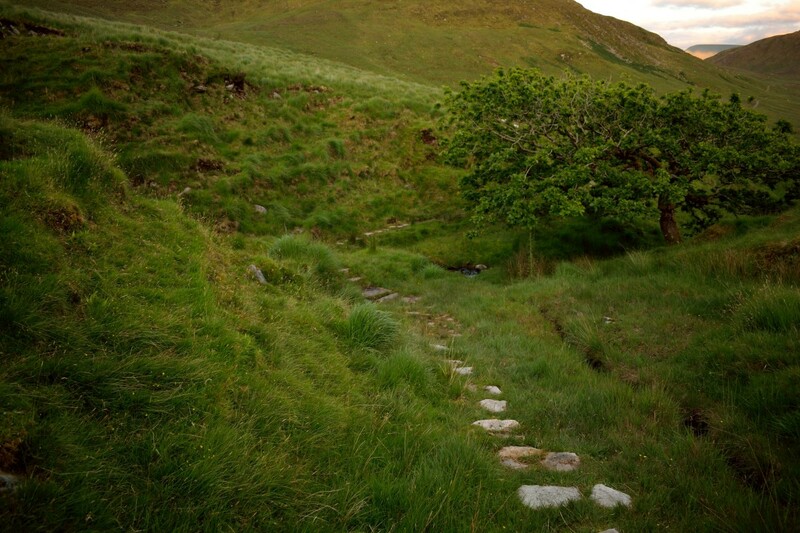 At times it was a rocky trail, littered with white Quartz, gleaming like rugged pearls against the drab colours of turf and bog. More often though, it was solid bog, requiring a scramble off the trail to try and get along relatively unscathed. 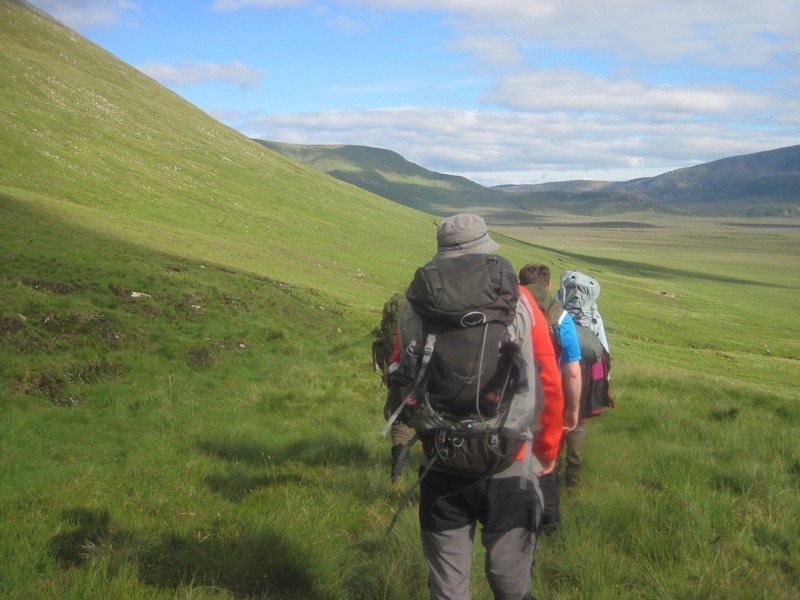 The inconsistency of the trail conditions made it tough going, as it was hard to get into any sort of a rhythm while walking, which added to the difficulty, but we were moving forwards and onwards to the goal of our overnight camp near Lough Avoher. We passed by the remains of old dwellings, and a small hut clad in well worn corrugated iron. There was sign on the door, long since faded to a white board by the elements, the message it once conveyed now gone. In places along the trail, improvements had been made by laying boards and stone steps across the worst of the mire. I’m unsure how long some of these had been in place, but the bog was already starting to grow over them in places, green fingers clutching at the edges of the timber and stone, as if to pull them in and overpower them. My boots had begun to dry a little, but didn’t stay that way for long, a hidden hole swallowing my right leg almost to the knee, leaving my lower leg coated in foul smelling black ooze. Thank the stars for gaiters! 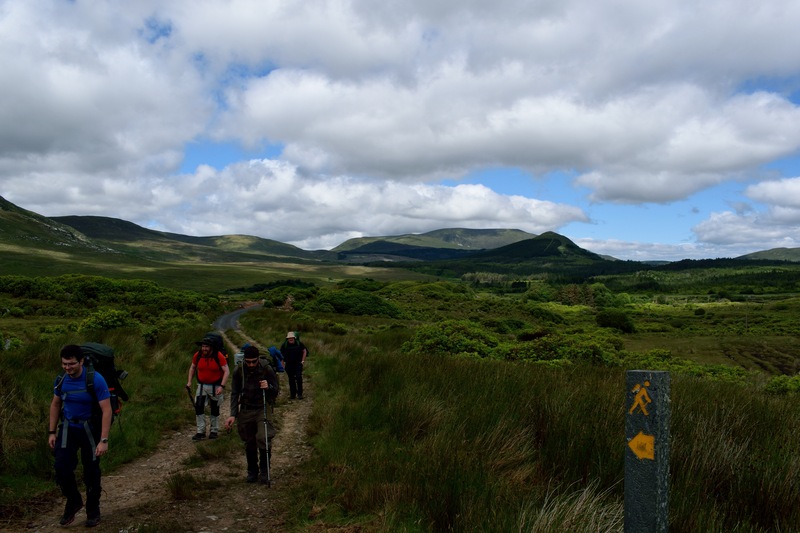 We contoured around Nephin Beg mountain, coming across a gnarled little oak tree, hunkered down in the shelter of a hidden ravine. A beautiful little untouched spot, we paused to enjoy it, before the sheltered location led the midge to emerge in their droves, and we pressed on to evade them. Dusk was beginning to fall as we finally reached the Adirondack shelter at Lough Avoher, our camp for the night. This shelter was erected by the volunteers of Mountain Meitheal Ireland, and much credit to them for it, we were certainly very glad of it. 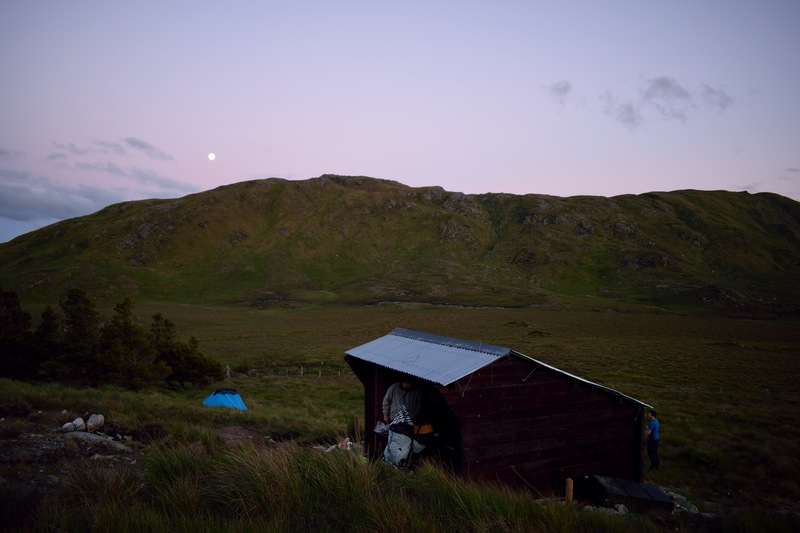 A pale moon was rising above the darkening hills, as nine soggy, sunburned and tired hikers sat and enjoyed some well earned food and rest. We sat and exchanged stories of our various encounters with the boggy terrain, and the stunning beauty of this Mayo wilderness. Apart from our own party we hadn’t encountered another person the whole way along the trail. It wasn’t long before we all bedded down for the night, a few had pitched tents, while the others bivvied down in the shelter. We arose the next morning feeling reasonably refreshed, and made our way onwards down the Bangor Trail. 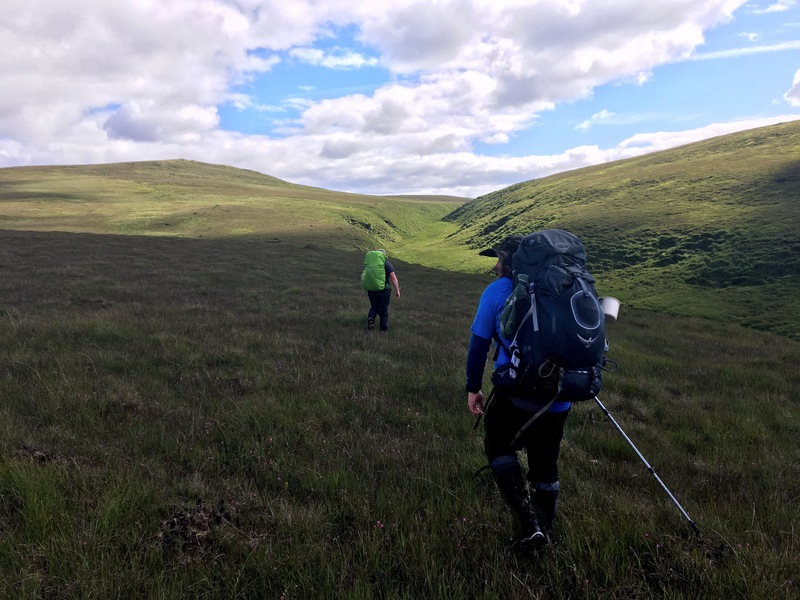 After a few miles on pretty decent tracks, we passed by the Bothy where we’d stayed on our first night, and apart from a couple of short off road sections, the walk was mostly on quiet back roads, a marked difference in terrain from the previous day. There was a difference in the terrain we were walking through as well, small farms and houses dotted through the landscape as we made our way to Newport. 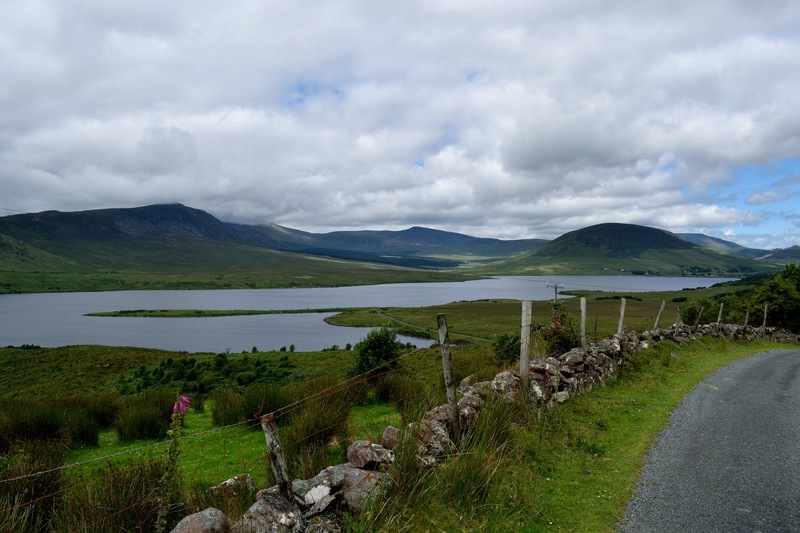 All the while we had fabulous views over Lough Feeagh and Furnace Lough as they glittered in the bright July sunshine. We could see anglers floating on small boats, flicking and retrieving flies with precision in search of trout. Soon we reached the outskirts of Newport, and the finish of The Bangor Trail, and then it was off to the pub for some well earned grub, and some pints to celebrate the end of our trek. Loved the write up and the photos are stunning. 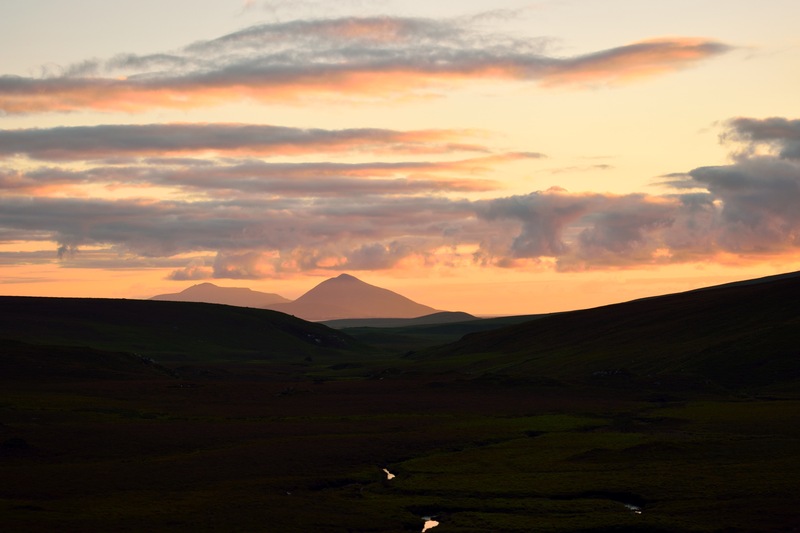 I was reading about the Wild Nephin project only recently. Nice post!